Today's So Shoe Me is the Sozen in White by YES, $175, available at Solestruck. 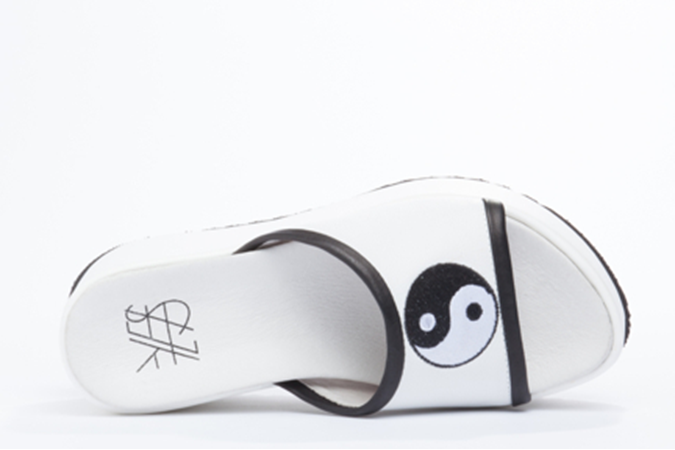 Bring your yin and yang together with these nice n' nineties slides by YES. This slip-on flatform features luxe white leather and an embellished yin-yang symbol for a sporty meets minimalist vibe this summer. The modern monochrome design with rad 90s details gives you the perfect high end platform for lounging to the beach or boozing at the bar. 4" of comfy chunky wedge and a 2" platform will make these your coolest and most comfortable sandals for summer. Pair these yin-yang slides with an oversized graphic tee and tropi-cool leather shorts for the perfect relaxed yet on-trend summer style. So Shoe Me a pair of yin-yang sneakers which share the best of both worlds with luxe materials and fun graphic embroidery for a chunky slip-on slide that will finish off my summer style.